Delivering documents is a snap with infoRouter. You will be able to deliver the right content to the right people in a timely and efficient manner. You will be able to deliver relevant documents through multiple channels such as the infoRouter Document Library, infoRouter Portals and email notifications. Universal access to documents and information critical to business processes is made simple through this mechanism. infoRouter brings together all the tools needed to form a collaborative environment. Administrators can delegate the management of Portals to "Portal Administrators". Secure access to infoRouter folders and documents. Automatic email notifications for multiple events (New, Changed, Edited, Approved, Rejected etc.). To find out more about infoRouter Subscriptions and Email Notifications, navigate to our help pages. Standard API methods that can be called from even remote servers to access infoRouter content. Custom applications can be developed to share information with infoRouter. To find out more about infoRouter Web Services API, visit our documentation pages that explain infoRouter Web Services API in detail. Electronic document delivery to authorized individuals is a great challenge for most organizations. Web content delivery usually involves webmaster bottlenecks or costly conversions. 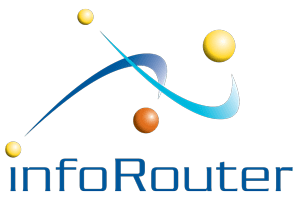 infoRouter provides a self-service document delivery environment in which documents can be shared with authorized individuals with great ease. For a full list of features, navigate to the Document Management Features page.